Grey Bear is a blogger, a writer and he is Polish. Grey Bear is said to be a huntsman, but we admire him for his films. Like this one, about famous actress Liv Ullman. Grey Bear obviously knows what he is talking about. And therefore, we have set up a correspondence with this promising young polish artist – a raw diamond, whose talent is yet to be discovered. We can proudly announce that we offered him time to speak at our next Cultural Afternoon* and that he even might accept this. So, please, dear reader, feel welcome to join in on this marvelous adventure of language and mystery! A Sunday we will never forget. *our next Cultural Afternoon: feb 2nd, 16:00, Zonneplein4 in Amsterdam! THE LETTER. a cultural afternoon about the words of life. Here a message from our headquarters. We have locked ourselves in and will now only communicate via The Letter. Anything you want to speak to us about? 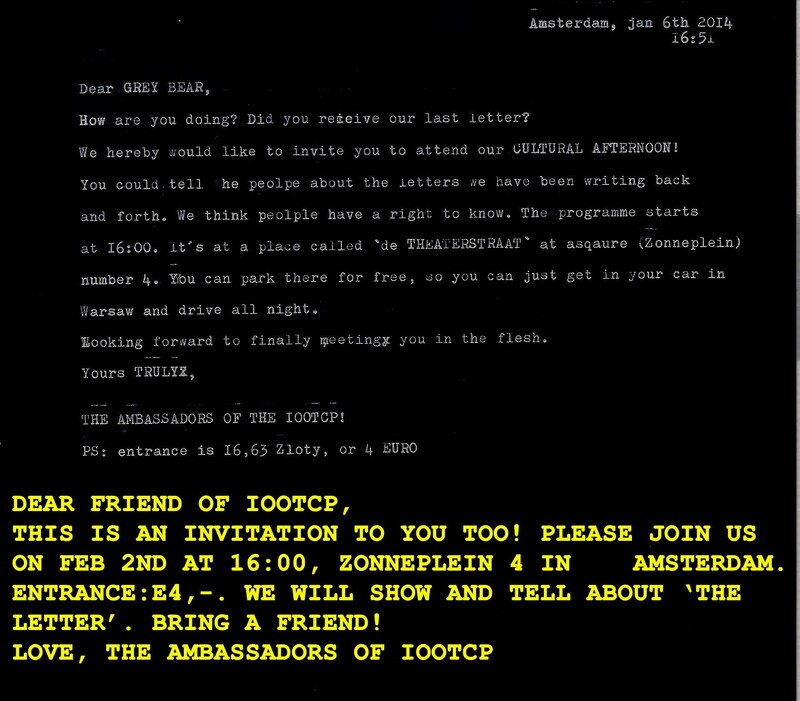 Send your words, written on paper, to: IOOTCP, Zonneplein 4, 1013RJ Amsterdam. We will show you the outcome of our enprisonment on februari 2nd, our next Cultural Afternoon.